First Nephi chapter 3 is the first half of an adventure story: what happens when Nephi tries to obey the commandments of the Lord, but it's not as easy as they had hoped. He experiences trouble from Laban, and also trouble from his brothers, as they have a hard time accepting failure. Nephi repeatedly urges everyone to obey the commandment of the Lord, and grows in his own commitment to get the job done for God, no matter what it takes. God delivers him by the hand of an angel from his angry brothers. to the tent of my father. This was a 2-way conversation. Nephi spoke with the Lord, not to the Lord. that thou and thy brethren shall return to Jerusalem. Lehi Vision #4 in the Book of Mormon is a commandment to return to Jerusalem. The Lord seems to have been speaking to Lehi at the same time he was speaking with Nephi. the importance of obeying the Lord’s commandments. that thou and thy brothers should go unto the house of Laban, and seek the records, and bring them down hither into the wilderness. Lehi reiterates that it’s a commandment from the Lord that they “seek and bring hither” the brass plates. This theme – that their journey is a commandment of the Lord – is repeated an impressive number of times in the short Book of Mormon story of the Brass Plates retrieval project. but behold I have not required it of them, but it is a commandment of the Lord. THIRD time – Lehi emphasizes that the Lord has commanded them to go back for the Plates of Brass. Lehi has three times emphasized obedience to what God has commanded. That’s just an introduction. Nephi will pick up this theme and run with it in his Book of Mormon writings. 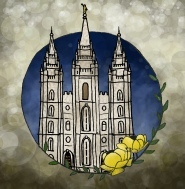 Some people criticize the “Mormon Church” because it has too many commandments. This is the same situation: The Lord gives commandments, and we can choose to obey or not, to recognize His hand in these commandments or not, to trust that they are for our own good or not. don’t murmur when He commands. because thou hast not murmured. Nephi will be favored of the Lord because he has not murmured. from the Book of Mormon is worth taking time to memorize. that they may accomplish the thing which he commandeth them. One reason not to murmur when the Lord commands something – He always provides a way to accomplish it. Our attitude should be “I will go and do,” not “I will sit and stew” (John Bytheway). As the Book of Mormon story unfolds, we know that Nephi didn’t see the end in the beginning, but just took it one step at a time. The Book of Mormon shows that faithful people will be blessed. he was exceedingly glad, for he knew that I had been blessed of the Lord. When Lehi receives the new command from the Lord to return to Jerusalem for the brass plates, Laman and Lemuel respond with predictable murmurs. Lehi tells Nephi he will be favored of the Lord because he has not murmured. Lehi and Nephi repeat no less than eight times in this and the next chapter that the excursion to Jerusalem to bring the brass plates is a commandment of the Lord. This is reason enough to do anything. When a person knows a commandment of God, they’re pretty much obligated to follow through and obey. After Nephi’s response to his father, the story becomes circular. Lehi had said Nephi WOULD BE blessed of the Lord for not murmuring. Then, when he heard Nephi’s faith-filled reply, he said that Nephi HAD BEEN blessed of the Lord, and therefore did not murmur. Faith has a positive energy, and it grows as it is exercised. This is a second key to receiving the Lord’s favor and blessing: don’t murmur. The first was in 1 Nephi 1:20, namely, have faith. The Lord is not in these Book of Mormon verses of Laman’s ignominious retreat from Laban’s house. Would it even have helped if Laman had invoked the commandment of the Lord to Laban? It wouldn’t have changed Laban’s response, probably, but it would have strengthened Laman to go in the name of the Lord and be rejected. of total commitment to obeying the Lord. until we have accomplished the thing which the Lord hath commanded us. Nephi’s original personal “I will go and do” is now augmented with an oath, in the name of the Lord, on behalf of the whole group to accomplish what the Lord had commanded (5th time). as we endeavor to follow the commands of the Lord. for behold he left gold and silver, and all manner of riches. And all this he hath done because of the commandments of the Lord. To Nephi, writing the Book of Mormon, being faithful to the commandments of the Lord means finding creative solutions. He thinks their father has already sacrificed their material possessions in keeping the first commandment (depart), and knowing how important the commandments of the Lord are, even compared to all their wealth, he is ready to trade their riches for the Brass Plates, to fulfill the second commandment. The Book of Mormon indicates that it may be helpful, in keeping God’s commandments, to understand why He gave those commandments. Nephi can say that it is wisdom in God to get the records for the sake of their posterity, because the Lord has already put into his consciousness the idea of his brothers’ and his seed enduring through the ages in another land. Apparently Nephi, as a young man in the commercial crossroads city of Jerusalem, knew enough about people from foreign lands to know that they spoke foreign languages. That seems to be his first thought. as given by His Spirit and power to prophets, and recorded in scriptures. since the world began, even down unto this present time. This Book of Mormon group has already had a few days in the wilderness, and Nephi and his brothers have experienced the condition of having only what they took with them. Nephi knows that to help his seed and his brothers’ families not rebel, they need the words of the prophets, not just his words. The Lord has given lots of commandments, not just the individual ones received by Lehi. There’s a whole heritage of knowledge from the Lord, and Nephi knows his family needs it all. He originally went on this mission to be obedient to his father and the commandment of the Lord. Now he is personally convinced of how important their assignment is. to be faithful in keeping the commandments of God. This is the 7th time that Nephi has emphasized in the Book of Mormon that this commandment is from God, therefore they should do it. when trying to obey the Lord, but He will stand by you. Why do ye smite your younger brother with a rod? and this because of your iniquities? and the Lord will deliver Laban into your hands. 1. They’re doing wrong right now by beating their brother (and they know it). 3. The Lord will deliver Laban into their hands. Modern parenting teaches that it’s ineffective to instruct a child when he’s angry, but that’s what the angel is doing. Maybe Laman and Lemuel already knew that Nephi was chosen to lead them, and the angel catches them in the act of uncontrolled anger, which they acknowledge is wrong, to prove to them that they are not worthy. It’s still hard to understand their later (and immediate) recalcitrance after this clear message. people are free to choose doubt rather than faith. And after the angel had departed, Laman and Lemuel again began to murmur, saying: How is it possible that the Lord will deliver Laban into our hands? Laman and Lemuel are still relying on themselves and their own resources, and not giving the Lord any credit. They’ve suffered two ignominious encounters with Laban, and they don’t have any more ideas or hope for success, even though the angel promised it from the Lord. In 1 Nephi 3 of the Book of Mormon, we see Nephi rapidly growing, from a boy in his father’s home listening to an awesome story of visions, to a boy who wants to know for himself, and prays, to a boy with growing commitment to his God, and understanding of why God’s commandments are important.